(Austin, Texas) –Austin’s most sustainable brewery, Hops & Grain, is stoked to announce they are adding another can to its permanent line-up! 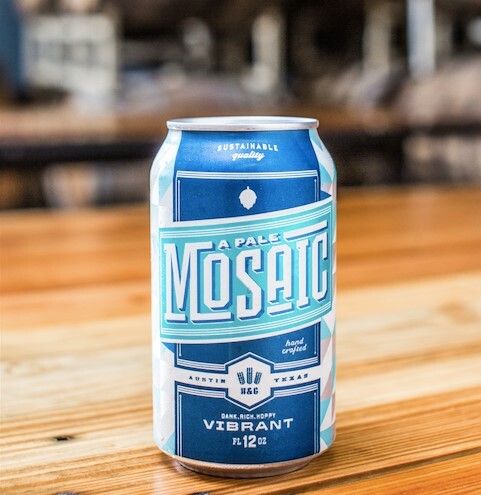 As of yesterday, the wildly popular A Pale Mosaic is available for purchase in cans on Austin shelves. Earlier this year A Pale Mosaic was released on draught at several local watering holes, and due to the overwhelming positive reception of the ale, Hops & Grain made the decision to get this bad boy canned, making it even more widely available. Hops & Grain: Specializing in craft beer and sustainability, Hops & Grain Brewery is located in East Austin (literally at the end of East Sixth Street) at 507 Calles, Austin, TX 78702. Hops & Grain Tap Room is open from 8 a.m.-10 p.m. seven days a week. Tours of the brewery given on Thursday and Friday at 5 p.m. Saturdays at 1, 3, and 5 p.m. Tours are approximately 45 minutes and include special samples not available in the tap room.